My first message to you is that I am very proud to be able to serve you again. We have a great organization and all of our friends enjoy being together at our regular meetings. Our Pot Lucks are the talk of the community. There always seems to be plenty of food and we always have good speakers. We have a big task before us in obtaining a new place for our museum. We are working closely with the Fair Oaks Recreation and Park District for them to have the San Juan School District turn over the John Holst School to them. Then we will have the opportunity to have one of the rooms for our Museum. Thanks, Russ! The gavel is now in Warren's hands! you to write a letter on our behalf to the SJUSD requesting this to happen. The Fiesta is coming up on May 6 and 7. Please help Lois Frazier when she asks you to be involved in this venture. I need some or many of you to do the table decorating at our regular meetings. Please step forward if you are interested. The next board meeting will be on June 21, 2006. Janet and I will be gone for 3 weeks in May. Ralph Carhart installing officers: Past-President Russ, Parlimentarian June, Treasurer RoseAnn, Secretary NOT Janet but Myrtle, First V-P Sherry Lynn and President Warren. Thank You, CALIFORNIA STORAGE CENTERS for helping us with a storage unit to place some of our antiques and memorabilia. We appreciate your donation of 2 months rent free for a storage unit and the reduced rate given us. In anyone in the Society needs a place to store, please call on the above business at 4245 Sunrise Blvd., Fair Oaks, CA 95628, (916) 967-3885. It is with regret (and notification to the U.S. Postal Service) that our January '06 edition did not reach you. We have repeated our article featuring the Huggett's home. Some members received copies at the general meeting. Don't forget January's newsletter may also be found on our website (www.fairoakshistory.org) under the newsletter archives in full color. We hope this edition will fill you in on our Society's happenings! 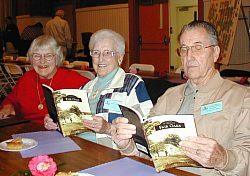 Adele Copeland, Ethel Young and Jim Poindexter are perusing copies of "Fair Oaks Images of America" hot off the press for $20. The order form may be found on the website. Sherry Lynn Wood has copies and you may reach her at (916)944-4812. April’s speaker is Chip Fong, representing the Veterans History Project. Chip is a Naval Aviation veteran and is retired from the State of California. Chip served in the Navy for 4 years with Fighter Squadron-92. After his separation from the Armed Services, he went on to complete a 25-year career with the California State Police and the California Highway Patrol. A long-time history buff, Chip is now satisfying his passion for history with this project. He is also a docent with the California State Railroad Museum. He enjoys traveling with his wife and spending time with his family. This information on the Veterans History Project is coming just in time for our veterans and their families. By making themselves available, they can share personal knowledge about their involvement during World War II and Korea. We need to do this before all of our World War II and Korean War Veterans are gone…so that they will never be forgotten! I would like to take this opportunity to thank our members for sharing their entertaining stories about their first memories of Fair Oaks. * Evelyn Heim is living again in Fair Oaks. She spoke of her grandfather, Earl Ricketts, who owned the northwest corner of San Juan and Winding Way. She talked about the San Juan Social Club, the Holt Caterpillar that her father used to harvest grain, how her parents met and remembered picnics by the Bridge. * Dr. Bob Barrett talked about how he came to live in Fair Oaks via the military. Bob trained in surgery at David Grant USAF Medical Center at Travis AFB in Fairfield in 1969-1973. One of his patient’s at Travis was George Johnson from Fair Oaks. Bob spoke of how much he enjoyed Northern California. George suggested that Bob consider settling in Fair Oaks. Bob’s last tour of duty was at Mather Field USAF from 1979-1983. Now Bob has been a citizen of Fair Oaks for over 20 years! 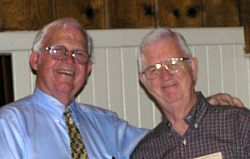 * Bill Hinsey spoke of living in the white block House on Park Drive in Fair Oaks, known as the Hinsey’s Grocery Store. * Sherry Lynn Wood shared how “It takes a Village to Raise a Child”. She shared the story of when her brother, the youngest of 6, who called himself “Car-Michael Pontiac John Wood” at age 3, would try to walk to Fair Oaks to buy candy with his pennies. Thanks to the close community, Michael only made it a few blocks before he was returned home. As children of the Fair Oaks community, everyone knew who belonged to whom. Children were watched and raised by the Village. It was hard to get away with anything! * Mary Nord came to Fair Oaks in 1955. Her family was one of the first Aerojet families to put down roots. They drove all night from Southern California to arrive before dawn. Her husband pulled off on a dirt road to rest and wait for the Real Estate office to open. The whole family awoke at sunrise to the roaring of the trucks speeding by from the gravel pits. Wasn’t that a loud welcoming for the "sleepy" in the town of Fair Oaks? * Reverend Larry and Dorothy Huggett spoke of coming to Fair Oaks. Larry told about being invited to ride in a 1922 Pearce Arrow across the Old Bridge, the Fair Oaks Fiesta and Sheldon’s General Store. Dorothy spoke of their welcome to the community, how she got an appointment with Wilma the hair dresser, getting a refrigerator with no credit, the plumber and praying for the truck. * Bill Kaggerud spoke of his first visit to Fair Oaks in the early 1950’s. He visited his Aunt and Uncle (the Saed’s) on the Chicken Ranch at Palm and Minnesota Avenues. The property backed up to the stream behind the Fair Oaks Grange. His cousin took him down to the stream to explore and cool off that summer. Now we all know what happened next! Bill had the worst case of poison oak in the history of the family and never wanted to come back to visit the Chicken Ranch or Fair Oaks again. * Terri Gorman came to Fair Oaks in the 1970's. In 1986, she worked for Otis Turner of the “Fair Oaks Post”. The office was on the hill by Oaks Hardware Store. She had a problem with the chickens. These were ones that Hugh Gorman let run wild. They kept eating the food that she put out for the cats. Terri never liked chickens and that did not help with her feelings about them. She wrote a letter to Hugh complaining about his chickens. To make a long story short, Terri and Hugh married and she lives with the Chicken Man. * Rachel Scott spoke of her years growing up in Fair Oaks, her love for the town, and her grandparents, Lee and Mary, who own the Murphy-Scott building. If you have an idea for a future program, please let me know. I want to bring historical topics of interest to all of you. I can be reached at (916) 944-4812 or e-mail at sherrywood1949@comcast.net. Gordon and Joan Heidt were docents at the History Center on March 12. A number of people attended as a result of the article in the newspaper about the copies of the Tattle by the Fair Oaks High School - 1902 and the Oak Leaves by Fair Oaks Publishing Co, -1907. The following people have also been docents this year: Diana Lennon, Lois Frazier, Larry and Meg Smart. The History Center is in the Administration Building in the Fair Oaks Cemetery, open every 2nd Sunday from l:00 to 4:00 P.M. The Fair Oaks Fiesta will be on May 6 and 7. The Historical Society will have an exhibit in the Old Library Building. Areas of interest will include toys, domestic items, learning/library. Also a laptop Power-Point presentation and our web site will be available for viewing. Hours are from 11:00 to 4:00 P.M. The Memorial Day celebration will be on Sat. May 27 at 10:00 A.M. at the Fair Oaks Cemetery. The theme this year will be honoring Purple Heart Veterans. A fine program of music, honorary speakers and placing the wreath has been arranged. 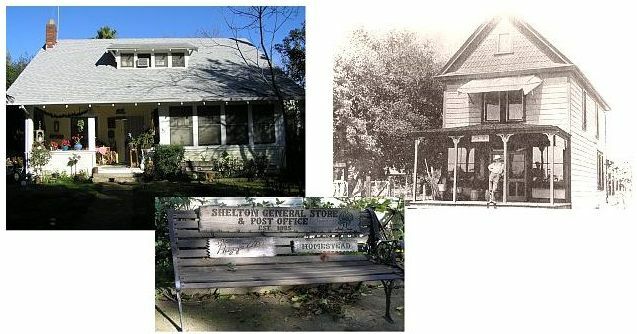 The Historical Society and the Orangevale Grange will furnish the refreshments. We will need 15 people to bring 2 dozen cookes. A sign up sheet will be available at the April potluck. We've added a new feature to the website for the convience of our members, a members-only section where we've put the list of Board Members and Committee Chairs and their phone numbers, the budget and financial reports, and the bylaws (1999 revision). We won't be putting any rosters or personal information on any members in this section - simply information that would be useful to members when you can't find your newsletter or bylaws. Any suggestions for other inclusions would be welcome. Inventory Project: Ken Steen, Joe Dobrowolski and I have been working diligently on the museum inventory project since January. 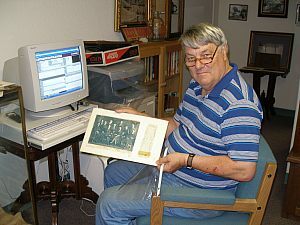 We're pounding the ID numbers, descriptions, locations and other information into the computer for all the photos, documents and objects in the museum. We're also tagging and protecting all the photos in archival sleeves. As of March 30, we've entered over 600 items into the database, and probably have another 600 left to do. When we're done, we'll not only have a complete inventory, but have the ability to locate similar photos by entering key words such as "Murphy" (for the Murphy Building) or "San Juan High School" into the search feature in the database. After that, we'll start digitizing the photos so we can create a backup of our valuable photos and a "virtual gallery" of our photos for the website. We plan to bring whatever photos we have trouble identifying down to a future general meeting, hang them on the wall, and have the old-timers give us a hand with the descriptions. Should be fun for all. It's a really ambitious project, but we're making steady headway. Must be capable of size reduction for use on letterheads and size enlargement for use on flags and banners. May use all common colors except gold and silver. Must contain the words Fair Oaks Historical Society. Font style is open. Could contain, but not mandatory, drawings or sketches of local items such as our bridge or oak trees. Submitted designs should be in final format rather than conceptual. The Society may ask for minor modifications to better fit its planned use. All designs must be submitted on standard typing paper 8 ½ x 11 inch in size. The top 1/3 of the paper must be used to depict the design. For presentation purposes, no portion of the design may be over 3 ½ inches in height or width. The center 1/3 of the paper must be used to present the rationale for the design. 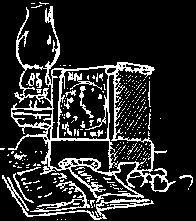 The text shall use #12 size print font with a style similar but not necessarily identical to New Roman Times. The text must be contained in an area no more than 2 ½ inches vertically and 4 ½ inches horizontally. The bottom 1/3 of the paper must contain a statement that reads With this submittal I forfeit all rights and privileges with this logo design followed by the author’s signature. In addition, the contestant’s printed name, address, phone number and email address should be included. All of this information should be roughly centered in this portion of the paper. All design must be mailed to the following address and be post marked no later than June 10th, 2006. The winning contestant will be awarded a plaque commemorating his/her accomplishment at the fall meeting of the Society. If you need requirements clarification or additional information call (916) 967-5010. Comments: This site was the General Store and first post office of Fair Oaks in 1895. The building was destroyed and the present home was constructed in 1922. Early occupants are unknown other than Glen & Lois Wright who sold it to Larry and Dorothy Huggett in l965. The detached garage was the site of an early repair garage. During Easter, the bridal wreath hedge is in full bloom and worth the time to stop by to see. Dorothy will celebrate Larry's birthday this coming August as she does every five years, this year on a Sunday. All are welcome.